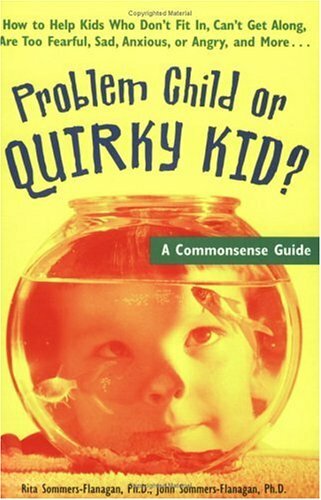 Review of "Problem Child or Quirky Kid?" In this book, the wife and husband co-authors, Rita and John Sommers-Flannagan, have promised to "Help Kids Who Don't Fit In, Can't Fit In, Can't Get Along, Are Too Fearful, Sad, Anxious, or Angry, And More..." Working in the field of Special Educational Needs myself, I hoped that this book support parents in talking down so-called Special Needs, by see behavior in context and by reasoning how behavior and thinking develops. Hence the title "Problem Child or Quirky Kid." Plunging in I found that, using the royal "We," Rita and John proffered answers to many troubling scenarios, case studies, and questions, resourced from their professional experiences. The book has many helpful and positive messages. Its exploration of "What's Normal" felt a bit worrying at first, but the authors' offer close referencing to child development and the anomalies of age and context, soothing my concerns initially. However, an anxious parent may well find that this book compounds anxiety rather than alleviating it. It has promised to talk down difference or at the very least, reason with it. I have the impression that many parents of troubling children get trapped into heat-seeking. By this, I mean that they may rapaciously devour the sorts of checklists, criteria and potential diagnoses proffered by Rita and John in this book, in their desperate struggle to explain their child's behavior, rather than anything else. Many such parents get locked into desperate searches for professional help and access to specialized services to support their child at any cost. This book is not calm enough to allay such desperation. It does not deconstruct the myths it promised to engage with. It masquerades as down to earth and common sense. What would I like to them to do differently? Well, I'd like the authors to grapple in the first place with the Nature/Nurture debate, thereby helping parents to consider the huge significance of their role in their child's behavior. Attachment Theory could be alluded to in order to support this. Then there are Howard Gardner's theories of Multiple Intelligences and the whole filed of Emotional Literacy. All these offer strongly referenced and authoritative voices to empower parents to understand their offspring. In their chapter "Problems with Attention, Hyperactivity and Impulsivity," the authors offer a plethora of diagnostic materials before offering any reassurance. The assertion that these behaviors aren't a concern if they are not "interfering with basic areas of ... life such as school" is tucked away underneath a set of criteria that will enable any worried parent to make their own un-professional judgment on the child's difficulties. I want this message emblazoned everywhere. It's surely the core message that all responsible professionals should be delivering to parents. If the "Quirky Kid" is getting on with life in their own idiosyncratic way and feels successful and reasonably happy, why stir up parental anxiety? Being a parent is troubling enough as it is. It is things like that in the sequencing of the book that I find troubling. My most radical response would see this book re-edited and all anxiety-building materials stripped out. For instance, I do not like to hear children categorized as "Resistant, Anxious, or Sad", because that is never all they are. "What else are they?" I would like to ask. I also feel that in any book about children I want to hear children's voices and views represented. Just in case that's not enough, I find the literary quotes heading each chapter are the indulgence of adults and distracting. What I want in a book like this is more about communicating and relating to children. More about adult anxiety and how this affects children. I want to commission a companion book from children, entitled Problem Parents of Quirky Adults, because I have feeling that it's not fair to have one without the other. I am a mother and grandmother with long career in the field of Special Educational Needs. I have specialized in supporting children with emotional and behavioral difficulties and their families. I haven't forgotten my own experience of emotional and behavioral needs as a child. I am a firm advocate for Children's Rights and for Children's and Young People's Participation.